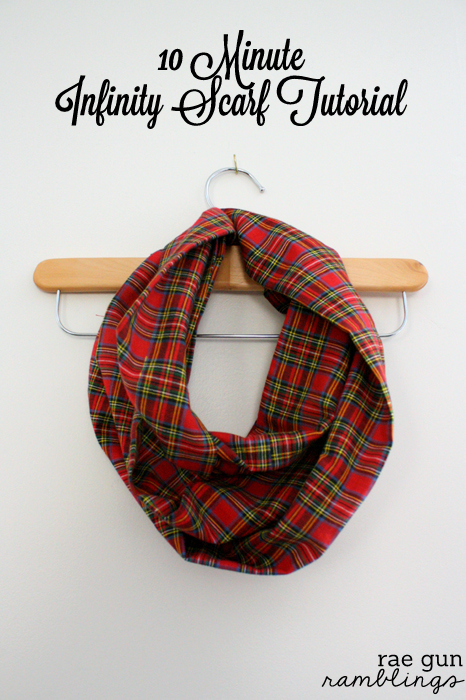 I’m not usually much of a plaid girl but a red Tartan during winter just screams Christmas to me. When I was trying to figure out what to wear to Freshly Picked’s Lumberjack party I thought a Tartan scarf would be just the trick. 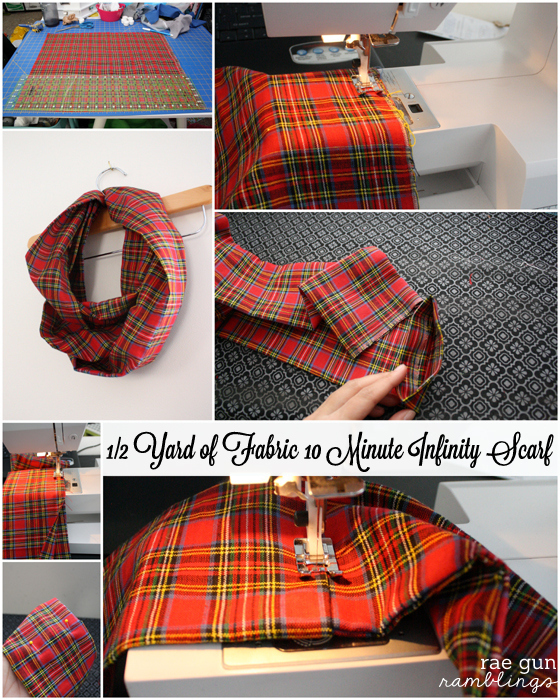 I found some perfect homespun Tartan fabric at Jo-Ann Fabric and Crafts and today I have a super easy 10 minute infinity scarf tutorial that is perfect for last minute gifts or to make your own fabulously festive accessory. You can use any type of fabric to whip this up. Kind of like my favorite cowl tutorial this is one of those projects that are perfect for gift giving since you can cater it to pretty much any type of style. Make it out of a thin flowy print to be worn in warmer climates and months or something as heavy duty as flannel or wool for cooler weather needs. I don’t intend to be confusing but I want to give you two options today. The only difference is a seam and how you cut the fabric. You can either use 1/2 yard of fabric and make 1 scarf or 1 full yard to make 2 scarves. The scarves will be slightly different sizes depending on which method you use but both great scarves. The one pictured here uses the 1/2 yard method. Cut your fabric in half so that you have two pieces each 9×44 inches. If you’re using fabric that is a little wider or slimmer than 44 inches it will work fine no need to cut more. Sew the short end of one piece to the other to form one long piece of fabric. Fold in half lengthwise with right sides together (making it skinnier) and sew along the full length. Turn right side out and fold one end under and iron. Tuck the other end in to the folded tube and pin. You should have one big loop. Sew closed and you’re good to go. Cut your fabric in half so that you have two pieces 22 x 36 inches. 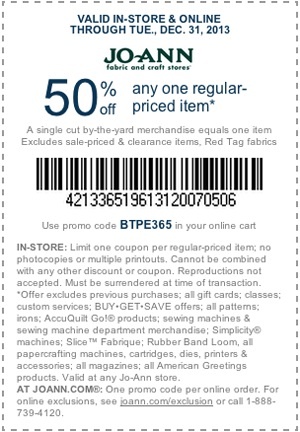 Thanks so much to Jo-Ann Fabrics and Crafts for generously offering a 50% off coupon for me to share! Also be sure to check out their awesome collection of fun holiday projects. awww thanks Lindsay, he is definitely intent on being obvious now! 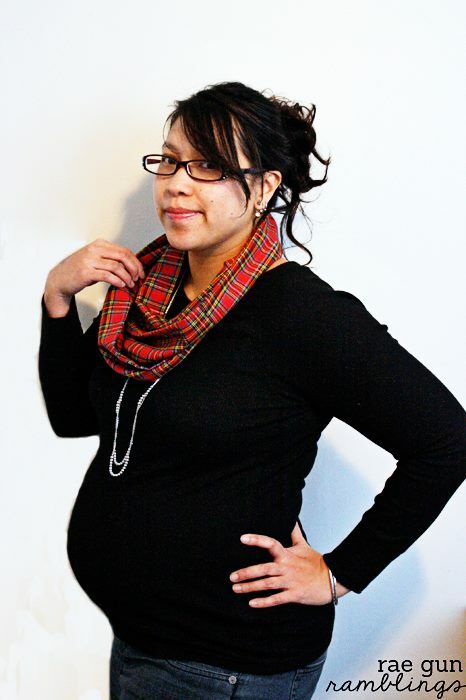 YOU LOOK SO PREGNANT AND CUTE! I am loving plaid right now! Very cute! Todhwuocn! That’s a really cool way of putting it! please send the instructions to me via email? Thanks!! Cute! Plaid is so in! 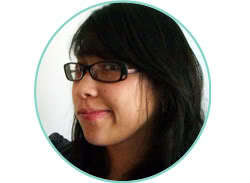 How cute and simple! Thanks for sharing with us at the Merry Monday link party. I hope you’ll join us again next week. Sharing your post on Twitter! couldn’t leave comment on cork reindeer as my stupid internet is being so obnoxious. By the way printed cork reindeer out, too doggoned cute not to make and quick, easy, inexpensive. 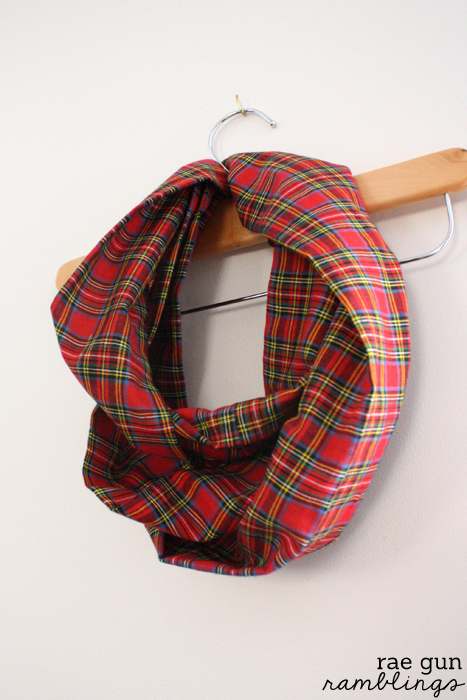 Now your scarf is also incredible, love fabric you chose, think will make trial scarf with some flannel already have. Sure looks easy and quick. Have been rounding up some ideas for things to make for gifts, this is a keeper along with cork reindeer, makes me smile. When is your baby due, how exciting. oh goodness you’re the sweetest. This post was from a few years ago, the little guy is 2.5 I can’t believe he’s so old!